This is an acrylic gridwall book shelf. The simple design of this shelf does not distract the customer from the products on display and also blends well with the surrounding design aesthetic of the environment. This shelf has a natural tilt to allow for an optimal viewing angle of your products. The gridwall brackets allow for a very easy installation. 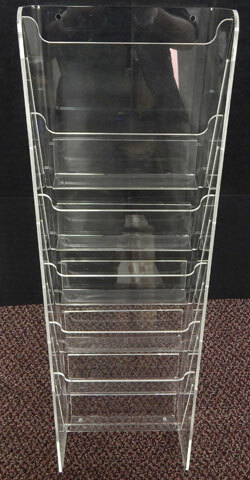 The acrylic materials used in the construction of our shelves ensure the most durability and stability.